When you’ve made a serious consideration to lease your next car, a smart question to ask yourself is which car is actually the best car to lease? It really isn’t all that difficult to answer this question. If you are looking for the BEST car to lease, one of the most important things to be concerned about is the residual value of the car you are considering to lease. By now you should know that a higher residual value will give you a cheaper monthly payment and if you want the very best car to lease, you’ll want a car that has a comparatively high residual value. Allow me to illustrate this with an example. Let’s say you are considering a lease on two competing cars, the Honda Accord or the Ford Fusion. You’re probably thinking this is a no brainer. That is, the Ford Fusion doesn’t stand a chance compared to the Honda Accord. Well, you may be right, but you have to admit that dismissing the fact that Japanese cars are generally more reliable, both cars are very similar in terms of what they have to offer. This would lead you to think that the monthly payments should be similar, but that is not the case. You need to consider each vehicle’s residual value. Take a look at the chart below to see an example of just how different the residual values can be for two very similar cars. 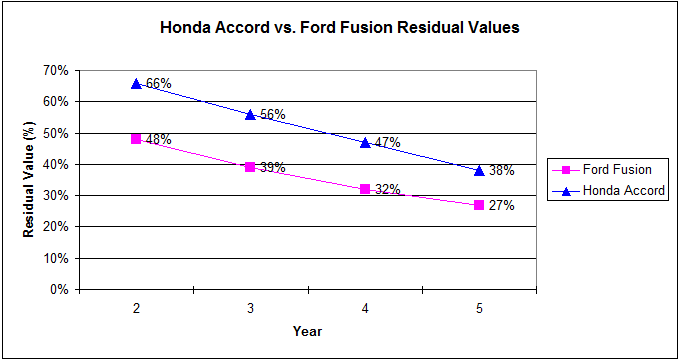 As shown in the chart above, the residual value for the Honda Accord is significantly higher than the residual for the Ford Focus. So remember, if you’re neighbor is paying less every month on his Focus than you are paying on your Accord, you definitely got screwed and the dealership from which you leased the car probably celebrated not long after you drove away in your new car. So what car would be the BEST car to lease? What follows is what I believed are 4 important factors you should seriously consider to determine whether a car you are interested in is the best car to lease. 1. The BEST car to lease has a comparatively HIGH residual value. By comparatively high I mean, if you were to compare it to other vehicles, does the vehicle you are interested in leasing have a high or perhaps the highest residual value? Remember, the biggest chunk of your monthly lease payment comes from the depreciation fee and one of the ways to get the lowest depreciation fee is by choosing a car with the highest residual values in the industry. 2. The BEST car to lease has a low selling price that is below the invoice price. Remember that the selling price is the price the dealership is using to calculate your monthly lease payment. The most important thing you can negotiate in a lease deal to get the lowest monthly payment is the selling price. The goal is to negotiate the selling price such that it is far lower than the MSRP and ideally, lower than the invoice price (which is most definitely possible). 3. The BEST car to lease has very few maintenance issues. Think about it, you are giving away a part of your income to a car company on the first of every month to have the privilege of driving it. So keeping in mind that the car is not yours, it wouldn’t seem be fair to pay for a car that has a track record of breaking down or other technical problems. 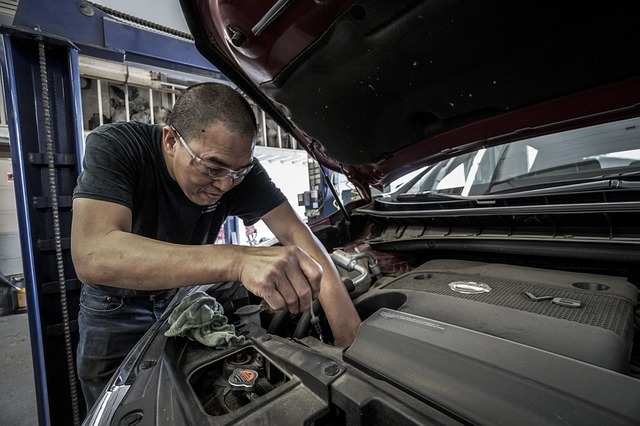 Of course, most if not all car manufacturers offer a very generous warranty package for the entire term of the lease should your car have any issues. However, you should not be forced to go through the hassle of taking time out of your life to take your car to the dealership for repairs. I leased a Honda Accord for 36 months and the only times I stepped foot into the service department of the Honda dealership was to get oil changes. This would be the ideal case for your lease. 4. The BEST car to lease has a long history of being a reliable car. Again, what’s the point of making a payment every month for something that you are borrowing if it isn’t reliable? Research the car you are interested in leasing to find out what problems it is liable to have. Most cars shouldn’t have any serious reliability issues for the first few years, which is great because your lease will last just a few years anyway.